​For centuries people have used ceramic pottery to carry water, cook and serve food, provide beauty and tell a story. I create bowls and dishes with very organic shapes and I find I am often inspired by nature and its textures. I often use antique laces, an art in themselves, to add texture and depth to my pieces. Each handmade piece tells it own story, through form, texture and color, you write the story of its function. A beautiful centerpiece for everyday, a candy dish that becomes a family heirloom or a ring dish to inspire a memory of when ‘she said yes’. I love that each piece of clay tells a story. I hope you enjoy both the function of my pieces and the story they tell. 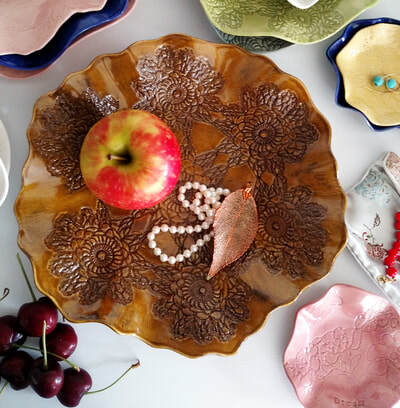 These medium and large ring dishes are bright, bold and perfect for creating joy in any space. Let their floral antique lace texture and hand stamped message inspire you. Use them to hold a handful of berries, or your favorite jewelry. The celadon glazes are hand painted and food safe. Placement of lace details and words will vary. This Candy Dish is 'gorgeous darling", in bright celadon glazes and inlaid with floral beauty antique lace and made to highlight any space. It is the perfect piece to add a little glam to any room. Give it as a gift or keep it for yourself! The candy dish is the perfect size for holding car keys, candy or small collectibles. Placement of lace detail and words will vary. A perfect dish to inspire you everyday. This ring dish will hold small sea shells or a pair earrings and will accent any dressing table. Textured with floral beauty antique lace, the word 'bloom' hand stamped and glazed in a bright, warm pink celadon glaze, it would make a great gift or treat for yourself! A perfect dish for holding your small jewelry or items for display. The ring dish can accent a dressing table or provide the perfect pinch of salt on the kitchen counter. These pieces are textured with a star petal lace. The glaze is hand painted and food safe. The ring dish makes a perfect gift for any occasion. Please select your color choice when ordering. Could anything be more gorgeous and darling than this ruffled edged trinket dish? 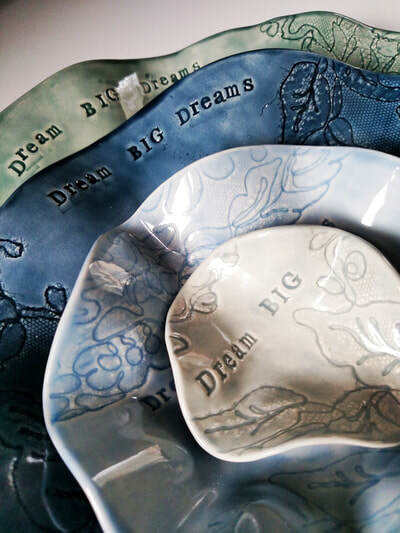 The perfect dish to add a bit of inspiration and whimsy to any space. Jewelry, candy or trinkets will be right at home in this hand made, food safe dish. Glazed in Cherry Blossom celadon it is flirty and feminine. A medium size ring dish, perfect for holding a few pieces of jewelry or spare change. This piece would also make the perfect accent to any dressing table or next to the sink to hold rings while washing dishes. 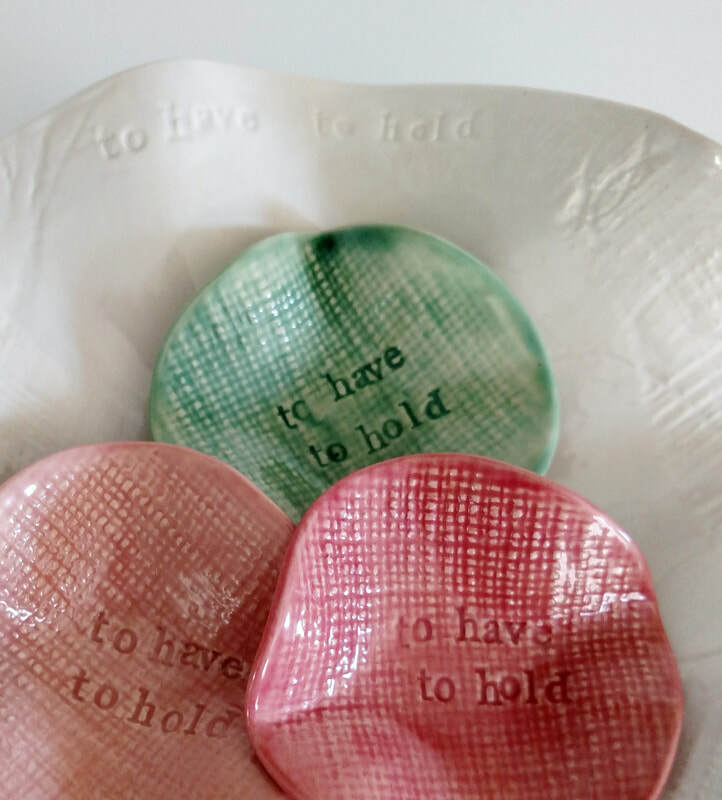 Each is hand made and glazed with bold and bright celadon glazes. Food safe. Please select color when ordering.